B0002. ENCYCLOPEDIC MUSICAL DICTIONARY (Large Soviet Encyclopedia), G. V. Keldysh, Ed. ; Compilers V. S. Shteinpress & I. M. Iampolskii. 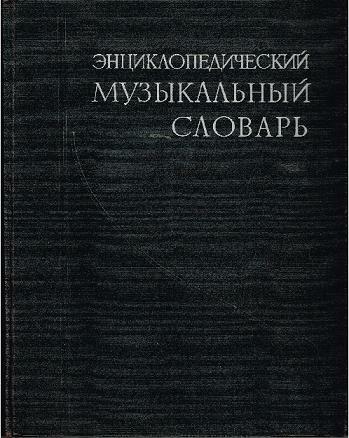 Moscow, State Scientific Publishers, 1959. 326pp. In the encyclopedia are articles on the activities of musical culture - composers, performers, musicologists, masters of musical instruments. 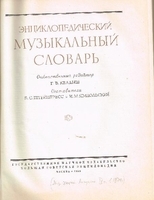 Special cycles of papers devoted to the basic concepts and terminology of the theory and history of music, institutions and organizations, musical instruments. 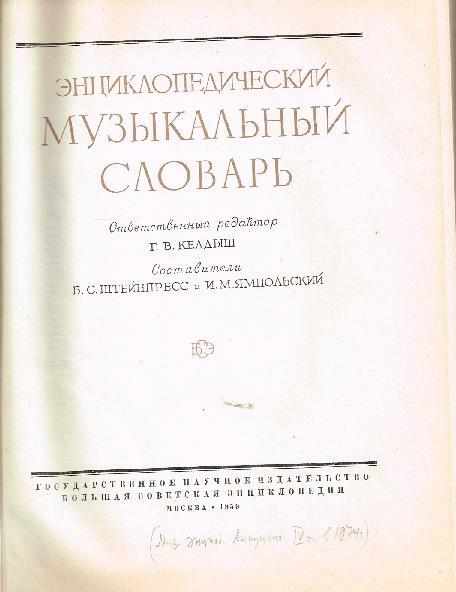 (Cyrillic Text) Excellent copy has various notations very neatly penned in. Illus.